Sossusvlei dunes and Namib-Naukluft Park. Departing from Windhoek in the morning between 8H00 and 8H300 with an collection from your accommodation in town, we travel via the small town of Okahandja towards the Private Game Reserve of Okonjati. From the Mount Etjo, we make our way to the Etosha National Park. The spectacular and diverse wildlife of Etosha is one of the major highlights of this 10 day tour. At Etosha you will experience some of the finest wildlife watching in Africa with game drives, and even at night at the camp's floodlighted waterholes. Leaving the wonderful wildlife experience of Etosha behind, we make our way towards the Southern Kaokoland region, near the little village of Kamanjab. Here we will visit a traditional Himba tribal village to experience and inter-act with one of Namibia’s last very tribal people. Leaving the Himba behind, we begin to travel in a southerly direction, into the scenic and unspoilt Damaraland. Moving from the rugged Damaraland region, we cross into the Skeleton Coast section of the Namib Desert along the Atlantic coast and to Swakopmund. This pretty old colonial coastal resort town on the Atlantic Coast, is the main tourist town on the Atlantic coast of Namibia. In Swakop there is time for optional adventure activities, and just to explore the various museums and points of interests. From Swakopmund, we travel via the Namib Desert, Kuiseb and Gaob Canyons to reach the fossil dunes at Sossusvlei. On our way we will do short stops at the Tropic of Capricorn and Solitaire. We will spend two nights and one day exploring the majestic high dunes of the Sossusvlei area in the Namib-Naukluft Park (claimed to be the world’s highest dunes). From Sossusvlei, we make our way back to the capitol of Namibia, Windhoek. Here your safari tour ends with a drop-off at your accommodation (Not included in the tour). One of the finest game reserves in the world, with a unique diversity of wildlife, birds and scenery. Depart every Saturday. Highlights: Sossusvlei & Sesriem Canyon, Fish River Canyon, Namib-Naukluft Park, Luderitz and Kolmanskop, Predators at Bagatelle and N/a’ankusê. Departs every Friday. 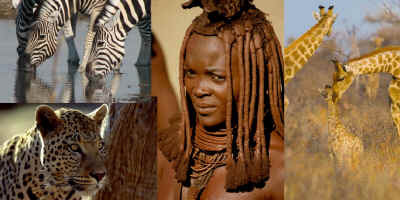 Highlights; Etosha Park, Himba tribe, Africat, Damaraland, Swakopmund. Departs selected Fridays. Highlights: Sossusvlei, Fish River Canyon, Etosha Park, Himba tribe, Africat, Damaraland, Swakopmund. Departs every Friday.